FLAAR-REPORTS has been attending ISA for over sixteen years, since ISA is one of the major expos in wide-format digital printing. 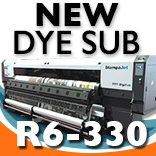 The main focus of this expo is wide-format printers, specifically UV-curing, textile, solvent, waterbased, latex, etc. Hence, lots of Inkjet inks, media and substrates and finishing equipment manufacturers and distributors will also be present at the show. For 2019, four members of the FLAAR-REPORTS staff will be covering the expo. After ISA 2019, we will be producing a series of reports on UV-curing and textile printers, inkjet inks, media and substrates, and finishing equipment. 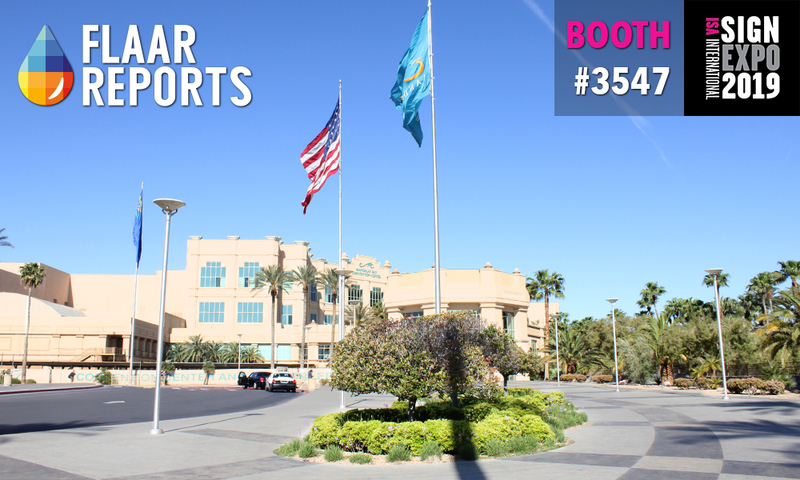 FLAAR-REPORTS will have a booth #3547, be sure to look for us there. We hope to see you at the show! Only one month away from APPPEXPO 2019 in Shanghai, China (March 5 – 8). We have been preparing for this trade show for a while, it is the largest exhibition in the Asian region. FLAAR-REPORTS has been attending APPPEXPO for over a decade and we are the appointed media partner for this trade show. The expo has constantly grown and each year more members of the FLAAR-REPORTS team are flown to cover APPPEXPO. 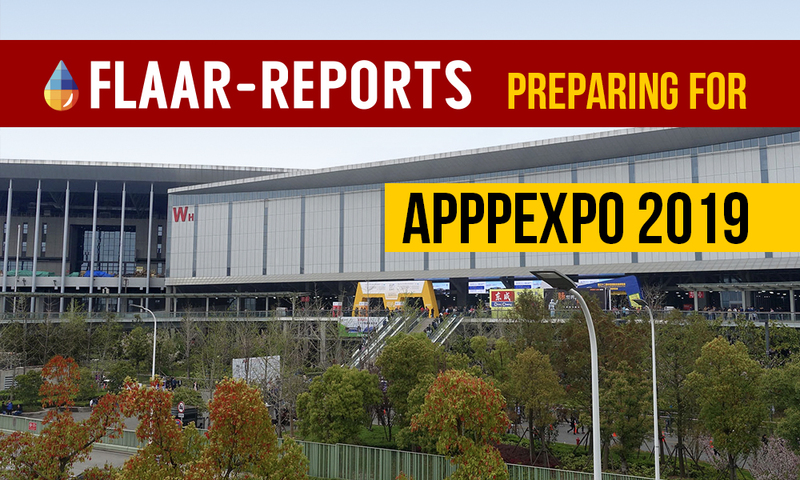 In order for you prepare for APPPEXPO before the show we have prepared a series of reports to help you understand what you can expect here based on 2018. It’s been over a decade since we first visited the beautiful city of Istanbul for SIGN Istanbul expo and been constantly attending this exhibition. 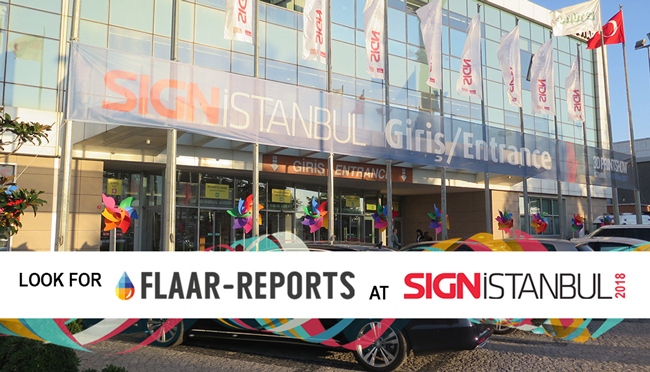 For 2018, two members of FLAAR REPORTS will attend SIGN Istanbul to cover the trade show. 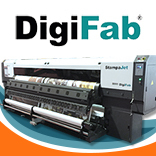 We will be reviewing wide-format printers, inkjet inks and media, finishing equipment, 3D printing, etc. 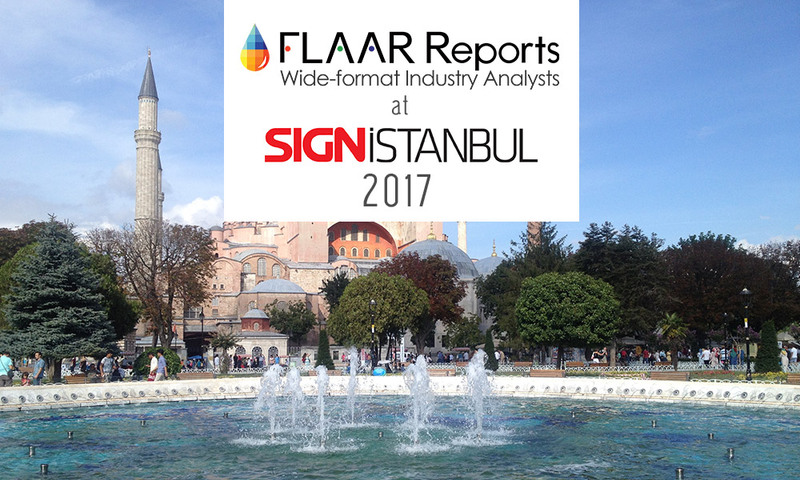 FLAAR-REPORTS staff, Nicholas and Maria Renée (at the center) will be attending SIGN Istanbul 2018. SIGN Istanbul is great place to see wide-format printing equipment, many applications and visual communication samples. You will find many digitally printed objects other then signage, plus many 3D printers and applications; which are now trending on the market. SIGN Istanbul will be held at the TÜYAP Beylikdüzü Fair & Congress Center in Istanbul, Turkey from September 20-23. Last May, FLAAR REPORTS exhibited at FESPA Hamburg trade show; next month you can find two members of the FLAAR REPORTS staff at FESPA Mexico 2018 from September 20-22. 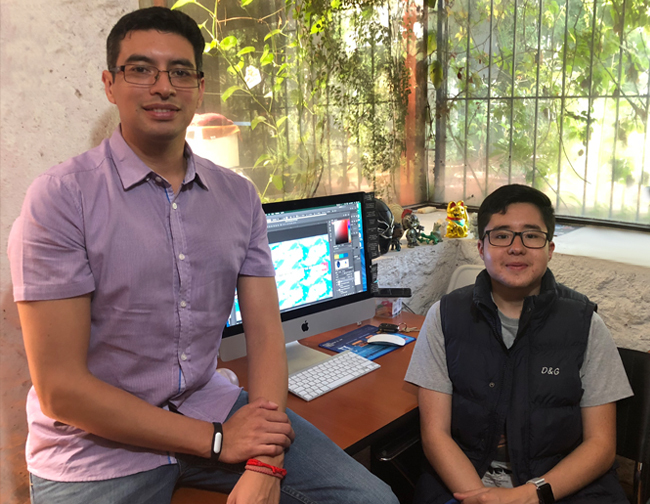 Pablo M. Lee and Marcelo Girón will be at FESPA Mexico 2018. 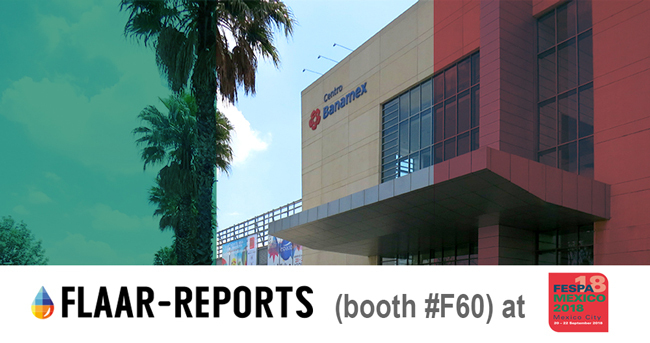 We will also be exhibiting at this expo in stand #F60, in the Centro Citibanamex Convention Center in Ciudad de Mexico. Mexico city is a beautiful and very convenient location not only for people from allover Mexico but also for people from other Latin American countries, especially Central America. FESPA Mexico is the largest printing expo in Central America and Mexico. There you will find many distributors for wide-format printers, inkjet inks, media and substrates, finishing equipment, 3D, software, etc. There will also be conferences, textile workshops and wrap masters contest. Be sure to visit our FLAAR REPORTS booth (#F60)! We will have full FLAAR Reports on all these shortly, but in the meantime, here is the initial summary. I apologize for the wrong spelling of GTX; on my computer keyboard the Z is too close and so I often hit Z instead of X: the proper name is GTX. Moderated by Prem Ramachandran, White Water PR. 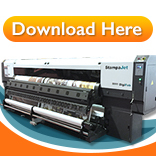 Challenges within the printing and signage industry and solutions to overcome it. 4 Impact of Expo 2020 on the printing and signage industry. Expo 2020 is a world class event that is a perfect fit for the energy and enthusiasm of the people and corporations of Dubai and the UAE. Three from FLAAR attended FIL 2017 in Guadalajara, Mexico. FIL is one of 5 best-attended book fairs worldwide. More publishers and many more thousands of books on display than you can imagine, but what is notable is that not one single printing press company has a booth. No matter how many e-books, Kindles and iPads are sold, if you saw the crowds here (over 700,000 visitors during 9 days) you would realize that plenty of people still want books. The crowds here on a single day are more than any sign printer expo in the world (though DRUPA 2000 and DRUPA 2004 were definitely memorable). So in addition to offset presses, etc, there sure is frankly unexpected potential for short-run digital presses, both toner and inkjet. We look forward to seeing and evaluating both toner and inkjet short-run digital presses at SGI 2018 Dubai, ISA 2018, FESPA 2018, Africa Print aspect of Sign Africa, SGIA, Sign Istanbul, and APPPEXPO 2018. Obviously GraphExpo is focused on traditional printing than book printing aspects of ISA and SGIA, but let’s hope GraphExpo co-locates before it ends up like Seybold, VISCOM Spain, VISCOM Paris, etc. And we really enjoy short-run digital press booths at the expos we attend since we are in our fourth year of developing educational books on endangered species of plants and animals in Central America. We do scientific books plus a second series to help children (and their parents and grandparents) learn about the remarkable eco-systems of Mexico and Central America. 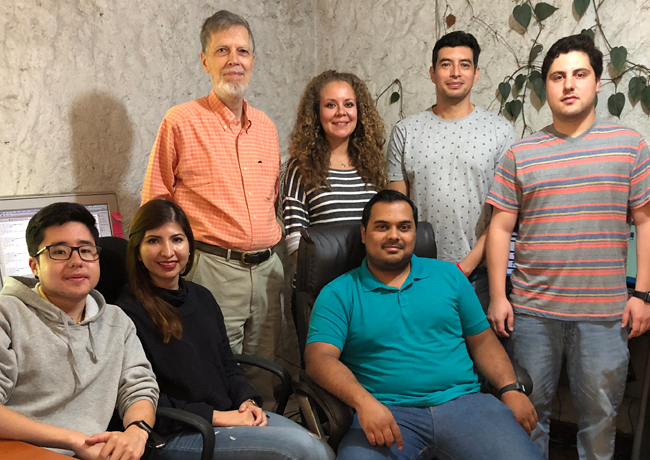 We look forward to interacting with short-run digital press companies to evaluate their printers and write about our experience in FLAAR (read by about 700,000 people worldwide, so comparable to the number of attendees at FIL here in Guadalajara). We are just excited to start a great year in Dubai. Two inkjet printer and signage production workflow equipment review editors from FLAAR Reports are preparing for SGI 2018 (Sign Middle East, Dubai, organized by IEC). Dr Nicholas and Marcelo Giron look forward to seeing you in friendly Dubai, January 14, 15, and 16, 2018. 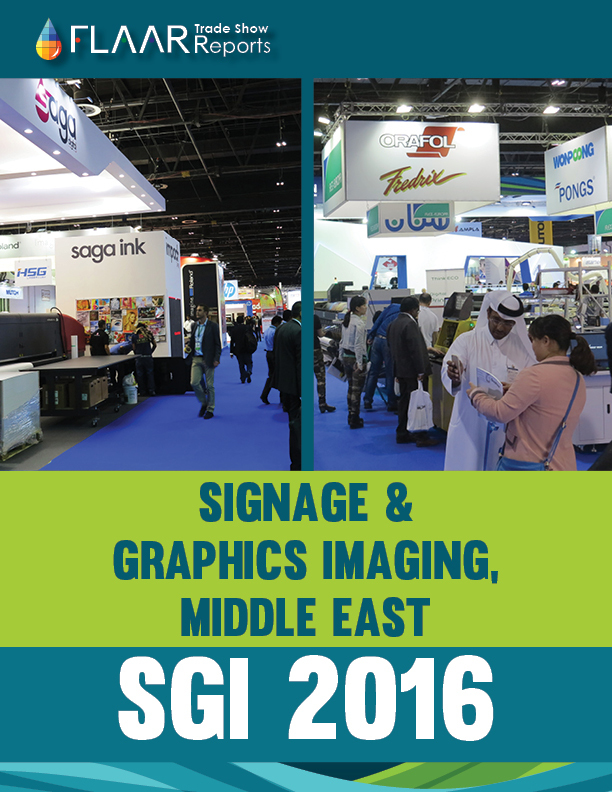 Marcelo has been two trade shows in Asia and looks forward to this international signage expo in Dubai. Dr Hellmuth has been attending the Sign Middle East expo for many years. We stopped attending VISCOM several years ago (VISCOM Madrid collapsed and VISCOM Paris is now evidently no longer continuing). This is why we prefer to focus on expos such as SGI Dubai: they are the best expo in the Middle East. 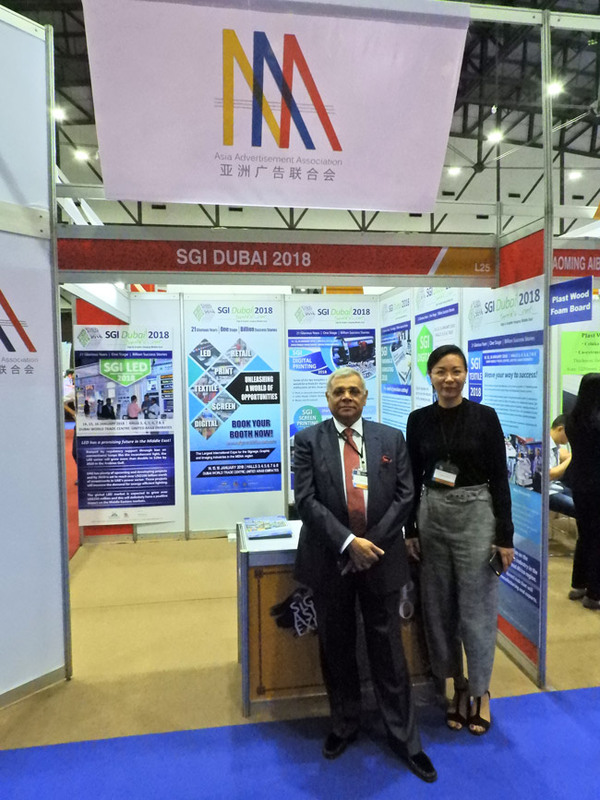 Plus, no matter what other expos you attend elsewhere in the world, to learn about the market trends in the Middle East and all the surrounding countries, it is useful to be at the Dubai expo every year. Sharif and Donna of IEC, as seen in their booth in the APPPEXPO Thailand area co-located with SIGN EXPO ASIA a few weeks ago in Bangkok. SGI 2018 also had a booth at KOSIGN where FLAAR Reports also attended. 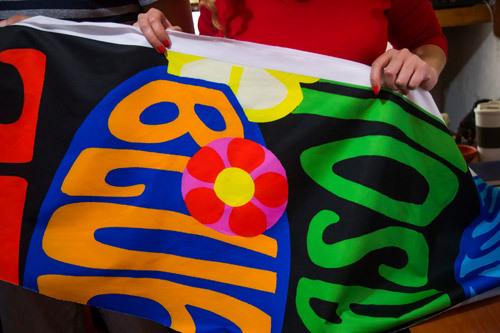 In addition to traditional signage, we are interested in textile printers (for clothing and décor in addition to flags and soft signage). There are more than 15 graphic designers in the FLAAR Reports office, so we always like to see the diverse style of designs at large trade shows. So we look forward to seeing the SGI Wall of Fame showcase. Plus Dr Hellmuth has initiated a T-shirt printer evaluation program. Our designers produce our own designs which we look forward to testing in the various booths at SGI 2018. We look forward to seeing our friends in the booths and in the aisles at SGI 2018 and hope to see you there as well. Many reasons for attending Sign Istanbul 2017: lots of printers of all sizes, shapes, and kinds of inks. 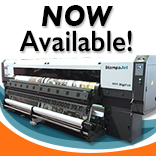 Many booths of printable materials; after-market inks, laminators, cutters, and other aspects of signage workflow. Plus there are more 3D printers (3D rapid prototypers) at Sign Istanbul then at all printer-signage expos we attended in USA and EU the last two years. Last year FLAAR assistant Senaida Ba attended Photokina, Tecnargila (ceramic printers), and Sign Istanbul 2016. She commented that she preferred Turkey because the people in the booths at Sign Istanbul were so hospitable. Even when we were in the aisles, the booth managers came out to invite us into their booths to look at their products. She really enjoyed the experience meeting all the pleasant people at this expo. 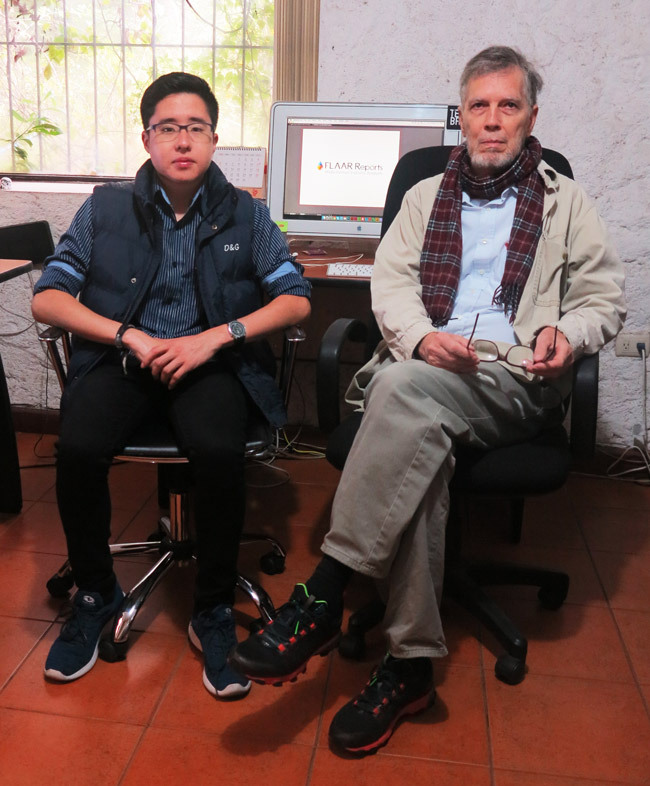 This year UV-curing printer evaluator Jose Melgar will attend Sign Istanbul with Dr Nicholas. 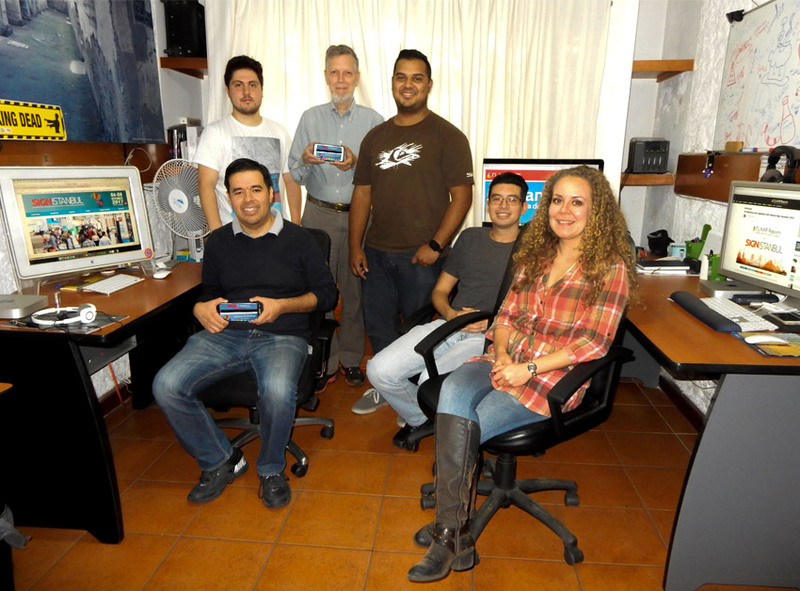 Jose Melgar has many years experience evaluating UV-curing printers, indeed last week he was flown to EFI Matan factory demo room to test their impressive printers. I must admit that what I also really like about Turkey are the historical sites, and the museums and historical architecture in Istanbul. I have to focus 100% on the printers, inks, media, cutters, laminators, 3D printers at the expo, but in past years I enjoyed traveling around the country and visiting key places within Istanbul. We hope to see you at Sign Istanbul, 4-8 Oct, 2017, Tüyap Expo Center outside Istanbul.